The modern fragrance industry uses some pretty scary chemicals. The average fragrance product tested contained 14 secret chemicals not listed on the label…. Among them are chemicals associated with hormone disruption and allergic reactions, and many substances that have not been assessed for safety in personal care products.” EWG adds that some of the undisclosed ingredients are chemicals “with troubling hazardous properties or with a propensity to accumulate in human tissues.” Examples include diethyl phthalate, a chemical found in 97 percent of Americans and linked to sperm damage in human epidemiological studies, and musk ketone, which concentrates in human fat tissue and breast milk. 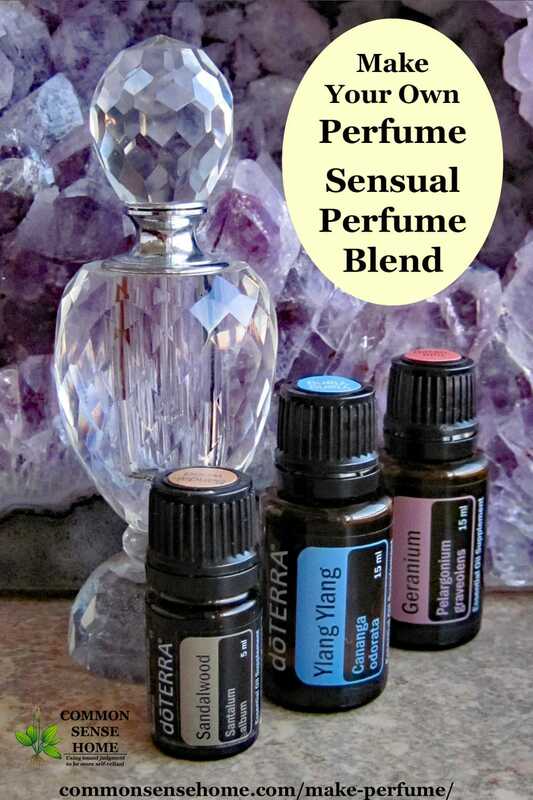 All you need to make perfume at home is a quality oil to use as a base, good quality essential oils, and a non-reactive container to store it in. I'm sharing some perfume making tips from my friend, Jo, at Jo's Health Corner. Jo is a wonderful lady with years of experience in natural health and using essential oils. Even though essential oils are derived from plant material, there's still a chance that an individual may be sensitive to them. Before using an oil that is new to you on the skin, Jo recommends doing a skin patch test by washing and drying the forearm and applying a single oil blended in a carrier oil to the arm – just enough to moisten. Ideally the area is covered with sterile gauze and left for 24 hours, then checked for any signs of irritation. If irritation occurs, topical use of that oil should be avoided. Which Oils Should I Use as a Perfume Base? To make perfume, simply mix the essential oils into the carrier oil and store in a glass bottle or roll on applicator. Put these blends in a pretty bottle, and you have a beautiful and functional gift – or just a little special something for yourself. Note: 0.5 fluid ounces of carrier oil equals about 1 tablespoon. If you want to make a solid perfume, use equal parts carrier oil and beeswax. Melt together gently, and then add fragrance and pour into container for storage. Which Essential Oils Should I Use to Make Perfume and How Much Should I Use? Jo recommends a blend of high, middle and low notes in perfume blending. The top notes are the most pungent and volatile. They act quickly and disappear quickly, and their first impression only lasts for about 30 minutes. They stimulate and uplift. The middle notes are more stable. Their scent unfolds anywhere from one hour to three hours after application. They soothe and balance the body, and they round out a blend with softer tones. Base notes are the least volatile and may be used as fixatives in a blend, holding in the fragrance longer than a blend without a base note. They are heavier and thicker than other oils, and are generally relaxing. Base notes are deep, warm, sensuous, and often sweet-smelling. 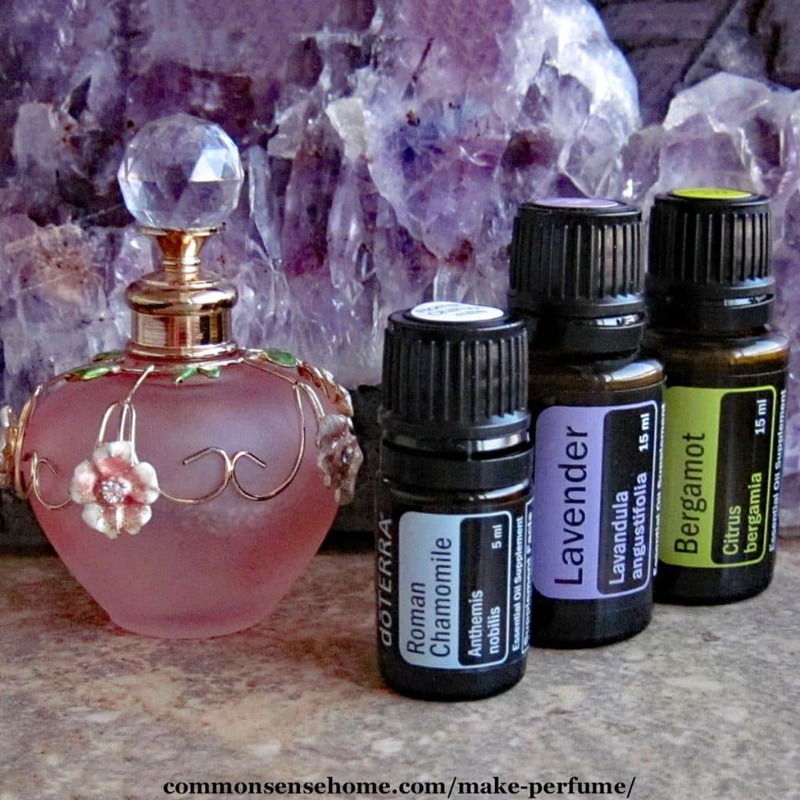 For a listing of which oils are top, middle and low notes, visit her post: “Make Your Own Perfume“. Jo has graciously allowed me to share some of her recommended perfume blends. I picked some of my favorites that I think will work well for my friends and I.
Jasmine always reminds me of the mystique of the Orient. 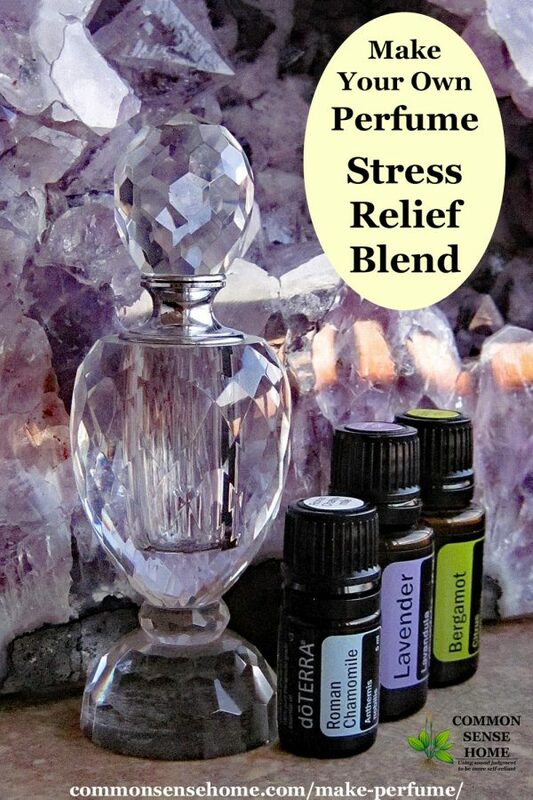 Indulge in a little self care with this stress relief blend. Enjoy this perfume blend when you need a personal pep talk. Put in roll on bottle and apply throughout the day as perfume. Try this natural perfume on your next date night. Thanks for reading, and don't forget to Share and Pin for later. Originally posted 2013, updated in 2018. Good article. Simple and easy to follow–where were you when i started blending oils a dozen or so years ago? I rarely wear anything but if I do I like mixing my own. I am very sensitive to a lot of scents out there maybe due to the chemicals but also that I am allergic to jasmine which unfortunately is a very common oil in many scent blends so you just learn what works best for you. I like using clary sage to balance some sweet scents very nicely. I can’t stand most commercial perfumes, so essential oils and natural scents like vanilla have been a real blessing to me. I like clary sage, too. 🙂 About a dozen years ago I was still clueless and wondering why regular perfume gave me a headache. I’ve heard of using vodka for a base for a natural spray perfume, have you ever heard of that??? Yes. I prefer the oil base because it is longer lasting, but you can use the same scent combinations in an alcohol base with 50-80% vodka combined with 50-20% distilled water. You can also infuse botanicals like vanilla or orange zest into the oil or vodka, and use that for a scent as well. I haven’t experimented with it, but it should work in limited amounts. Does it matter what size dropper you use? What do you recommend? Hmmm… I didn’t realize that there was a large variety of dropper sizes. I just have a standard eye dropper, as far as I know. I am looking to make my own perfume that smells like Angel or Alien. Do you know the oils I will need to buy? Sorry! No idea what those fragrances smell like. you are a genius! Thank you. ( and your nose)!! which oils would you use to make this into an EO roller ball? Do you have a recipe by chance? Is it possible to make a large quantity and then divide it up as needed? Sure, I don’t see why not as long as it’s well blended. Great info, thanks. I bought some sachet recently that smells divine. It says it’s lavender, jasmine, and amber musk. What do you recommend for the amounts to mix? And what base. I’m not a professional perfume blender, and I can’t smell your sachet over the internet. I’d probably use a neutral base, just like in these blends, and experiment with oils until you find a blend that you like. I really have no idea what “amber musk” would be as a natural oil. I am interested to know if you have a recipe for the fragrance of Amber White or Amber Rose. No, I am not a master perfumist, only a dabbler. Thanks, that’s a great reference to know! For the stress relief blend, what’s a good substitute for Roman Chamomile, which seems in short supply currently? You might try Blue Tansy, if you can find that instead. Should these perfumes sit for about 2 weeks before being used? They can be used right away, but waiting a bit will allow the oils to mellow and blend. Thanks, going to try this. Have you ever heard of MCT (Medium Chain Triglycerides) Oil used as the carrier oil? Or coconut oil? I just wonder if they are not recommended by you? If you wanted to fractionated coconut oil or MCT oil, I don’t see a problem with it, they just tend to be a little more expensive and a little less available. This is great! I’ve read that certain scents can trigget bad behaviors in children, and I am about to enter the preschool field, so I have to say “goodbye” to my perfumes. I don’t have many essential oils on hand, but I am a sucker for lavender. Could I just mix the lavender eo with a carrier oil and leave it at that? Thanks! I have dried tonka beans which I would like to use in making solid perfume. How do I best obtain the crystals from the bean, or do I need to do something else with them in order to get their fragrance? I haven’t worked with tonka beans, but as I understand it, you’d probably have the best chance of extracting their fragrance by chopping them and tincturing them in alcohol. I just purchased Ylang Ylang, Bergamot, and Vetiver to mix with coconut oil. Any idea on the mixing ratios that I should use for 10ml roller bottles? 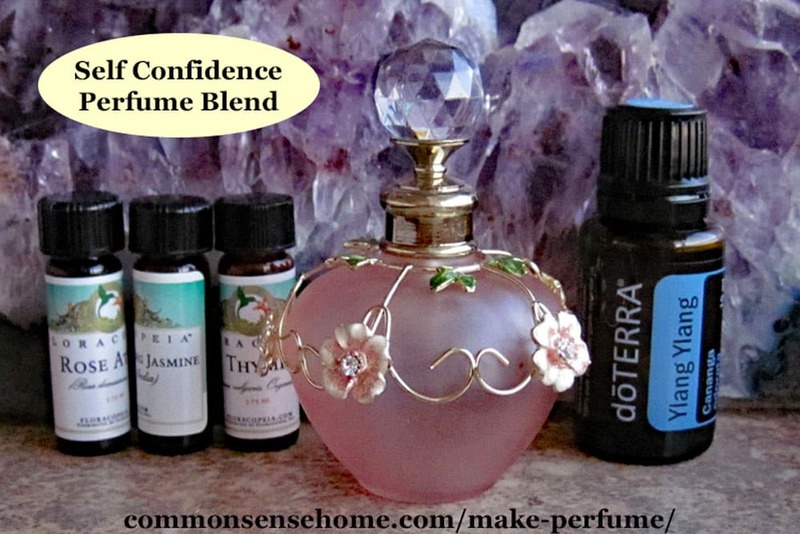 Follow your nose, and if you need a quick blending guide, visit Jo’s more detailed post on how to make perfume blends. I was searching for information to make my own oilbased perfume and will try with these information. I want to subscribe to received information about perfumes. I thank you. This is my only perfume post, and likely to stay my only perfume post for the foreseeable future, so I wouldn’t recommend subscribing just for perfume recipes. You can purchase carrier oils online or through stores that provide quality oils. Fractionated coconut oil is a liquid, and is more commonly used for skin care than cooking. You could probably use the same olive oil for cooking or scent making, but it should be good quality oil, not cheap substitutes. Click here to buy fractionated coconut oil on Amazon.com. Click here to buy a variety pack of four different carrier oils. The base notes are the long lasting, but exactly how long the scent persists on the skin will also depend on how much is applied, the carrier oil, the body chemistry of the individual it’s applied to, and other factors. Someone with very sensitive nose, and/or someone who uses way the heck too much perfume. Sir, such a perfume would be an assault weapon, and I’ll have no part in its creation. For those who are chemically sensitive, very strong perfume and other strong fragrances can cause significant health issues – even if the scent is from a natural product such essential oils. Being around someone wearing a strong fragrance gives me a headache in a matter of minutes. As for essential oils, there are many places you can buy them. Spark Naturals is a reputable brand, and the ship worldwide via amazon.com. You can see some Spark Naturals essential oils here. You can also order directly from Spark Naturals for a better selection of products. Click here to visit Spark Naturals. 4) Capture all your urine afterwards for about 2 days. Don’t do it. Just don’t do it. I’m looking for a non-phototoxic substance for the Bergamot. Would that be a good substance (scent-wise)? Palmarosa has a more rose-like scent, whereas bergamot has a more citrus scent, but palmarosa doesn’t cause photo-sensitivity. Plant therapy makes a bergaptine free bergamot which would be non photosensitive. Hi, do you have any ideas about how to turn a solid essential oil perfume into a roller ball perfume? The ratios needed of oils seems very high in the solid recipes , compared to the roller ball formulas. Is there any formula to do this? Can you take a guess ?? I haven’t worked with the solid perfumes, but you could try taking the total number of drops down to a similar ratio as the recipes shown here, and then increase if needed. You can always add more, but you can’t take the EOs out once they’re in. Would witch hazel make a descent perfume? I don’t want to get my clothes all oily once I roll or spray carrier oil on my body. The perfume may not be as strong or last as long, but you can use witch hazel extract as a perfume base. Hi, I am quite new to this but I am very interested in making my own perfumes (I can’t stand commercial ones either). I quite like lavender, and I was wondering if it’s a good idea to blend only a carrier oil (grapeseed) and lavender – 10-15 drops maybe. Would this one last? Or do you really need a base note also and a top note? Momentarily I only own ginger, patchouli and tea tree oil and I don’t think they smell best together. Also, do you have any experience with alcohol and is it better to use alcohol, or can you use both a carrier oil and alcohol together? Thank you! If you want just lavender, try just lavender and see how you like it. Essential oils will hold their scent best in an oil base. Depending on the quality of the original perfume, you should be able to stretch it. If you’re at the end of the bottle, there’s certainly no harm in trying. Sure. There’s nothing wrong with simply wearing your favorite oil in a carrier oil. hi, do you think strawberry oil, rose oil and peppermint oil will compliment each other, with rose as top note, strawberry as mid and peppermint as base? Sounds like a fruit salad. Would probably be pleasant. Hello,i have make a perfume of 5 drops of Rose,5 drops of Lavender in a 5 ml perfume roller in fractionaded coconut oil.What can you say about the mix,since both are 5 drops and what benefit do this perfume do me? Should i have more drops in it ? Or is it just fine,and i get the benefit of the aromateraphy as it is? I think it is lovely,but i will have the benefits of the oil too..
May I recommend the book “Aromatherapy for Beginners: The Complete Guide to Getting Started with Essential Oils“. It’s free for Amazon prime subscribers, and the paperback copy is quite reasonable, too. I would like to know your opinion on my question,thank you!! Every person is different. Some react to very small doses, some require more exposure for a therapeutic dose. How much is enough for you? I don’t know. That’s why I suggested doing your own research. Lavender oil is commonly used for stress relief, but may also help with anxiety, insomnia, depression, and restlessness. Rose oil is good for self-esteem, confidence, and mental strength. It’s also commonly used as an aphrodisiac. Both oils are also used for wound care, and are antiseptic.